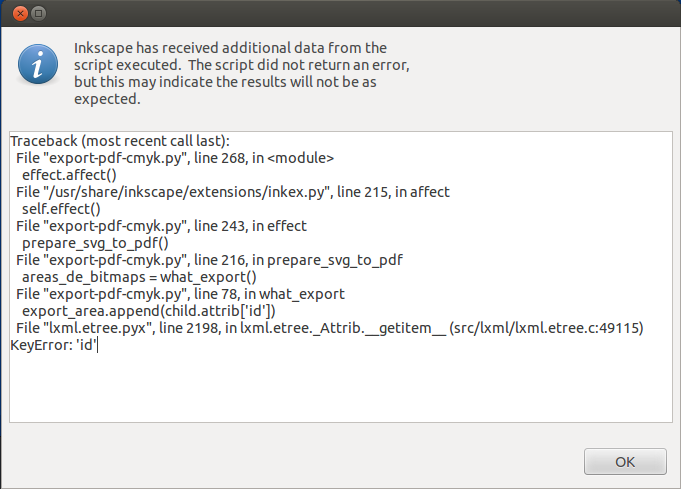 I'm trying to use the PDF CMYK export plugin for Inkscape, but it fails when I save the document. I have selected an ICC profile (A FOGRA39L.icc profile) and applied it to most of the colors in my document. Am I doing something wrong? Is this known? Apparently, the extension is not supported anymore and is replaced by the outputpro plugin. Unfortunately, the outputpro plugin only exports to JPEG currently (and is only in Portuguese). Not the answer you're looking for? Browse other questions tagged inkscape pdf cmyk or ask your own question. Inkscape: How to export the grid to PDF? How to embed a color profile into a PDF with Inkscape?